Evil has returned to the coven. Shaman Keir’s coyote, his witch’s familiar, is kidnapped. Worried the coyote faces heinous torture & possible death, he must find a way to rescue his familiar. At the crime scene—a stream in one of the coven’s magical ravines—he can’t find solid clues. An enchanted willow reads his frustration, passes his despair to the wind coursing southward along the waterway. 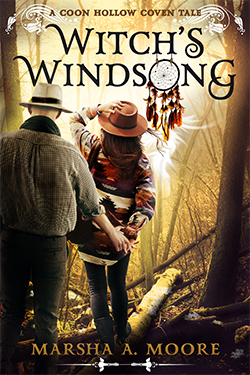 Far south, Unole, the talented daughter of a Native American wise man & Keir’s mentor, reads that wind and hears his plea. Realizing the wronged man is Keir, her teenage crush, she’s eager to help—until thwarted by a past deal of black magic she now regrets. Using a harmless promise Unole made, along with a secret buried deep in Keir’s past, the kidnapper weaves a dangerous web of deception endangering everything—Keir’s coyote & career, the love he & Unole just discovered, and even his life.